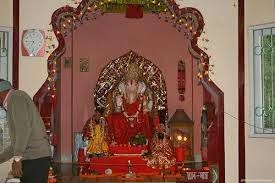 Here is Some Information about Ganesh Tok Temple in Gangtok Sikkim India. Significance: One of the best temple. 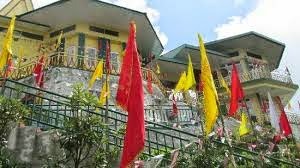 Ganesh Tok, a small temple, is located at a distance of 7 kilometre from Gangtok.It stands at a height of 6,500 feet.The path to Ganesh Tok is covered with sacred flags hoisted and tied across the roads. The flags are colored in White, Red, Green, Blue, Yellow and Purple. The path looks like rainbow and it gives tourists hidden excitement approaching the temple of lord Ganesh. The flags are believed to be very sacred and on each flag something is written. The Sky gets covered by these flags and make a unique scene. Like the Hanuman Tok, the Ganesh Tok offers a fascinating view of the surrounding regions. One can get a clear view of Gangtok, the capital city of Sikkim. The premises of the Raj Bhavan can also be viewed from this mandir. If you visit the Ganesh Tok in Sikkim on a cloudless day, then you might be fortunate enough to catch a glimpse of the magnificent Mt. Khangchendzonga. The space within the temple is not even sufficient to house one person at a time. Infact, the devotees have to literally creep into the mandir to get a glimpse of Lord Ganesha. The Ganesh Tok at Sikkim is situated at the top of a hill close to the television tower of Sikkim. 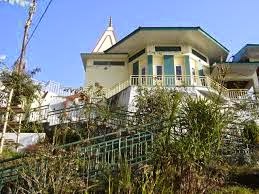 If you want to visit this mandir set in serene natural surroundings, then you have to reach it by the Gangtok-Nathula Road. The tourists who come to visit the Ganesh Tok at Sikkim, can get some refreshment at the cafeteria, specially kept open for the convenience of the tourists. Very close to the Ganesh Tok, is a garden. A stroll down the path bordered by pine trees in the garden is a very soothing experience for the nature lovers. The mandir is small but very beautiful and attractive. The heart taking sceneries all around the clean atmosphere and architecture of mandir is a heavenly delight for every visitors. 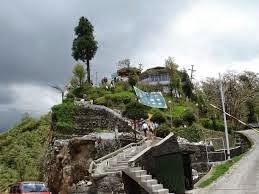 This mandir is most famous mandir in Gangtok Sikkim along with Hanuman mandir more commonly known as Hanuman Tok. 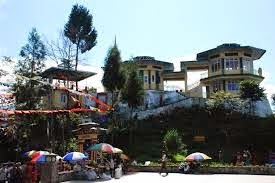 By Road: Ganesh Tok is a popular tourist destination from Gangtok and included in the standard local package sightseeing tours offered by the taxi drivers. By Rail: The Nearest Railway station is Gangtok junction. By Air: The Nearest Airport is Bagdogra in West Bengal 124 km.